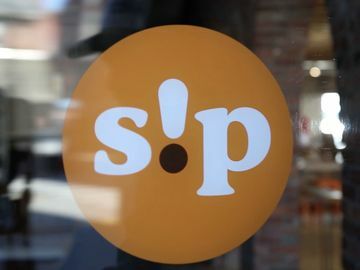 Father’s Day is quickly approaching this weekend and we have some great last minute gift iDDeas to keep your Dad running. 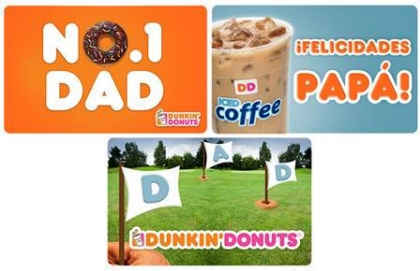 Whether it’s a “This Dad Runs on Dunkin’” Tumbler, a Father’s Day themed mGift or a DDelicious grilling recipe using Dunkin’ Donuts freshly brewed Iced Tea, we’re here to share all the details with you so you can make this Father’s Day a special one for your Dad. Give your Dad the gift of Dunkin’ with an mGift, a virtual DD card through the Dunkin’ Mobile App, which is available for both iPhone® and Android™. 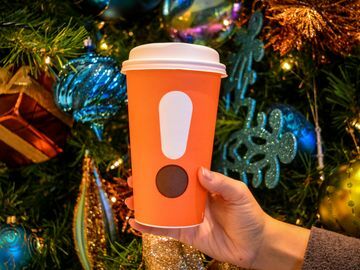 Simply go to the “Gift” toggle on your Dunkin’ Mobile App and select one of the three fun Father’s Day themed mGifts, a monetary value and the delivery method – text, email or Facebook. You can even add a personalized message to your mGift so you can wish Dad a Happy Father’s Day! Our 16 oz. 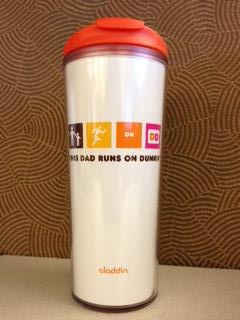 “This Dad Runs on Dunkin’” Tumbler is the perfect gift for Dad to enjoy his Dunkin’ Donuts Coffee at home, in the office and on the go! This double wall insulated tumbler, which has a suggested retail price of $6.99 (plus applicable state taxes), is top-rack dishwasher safe and BPA-Free. It also features a flip top lid and is spill-resistant and car-cup friendly. 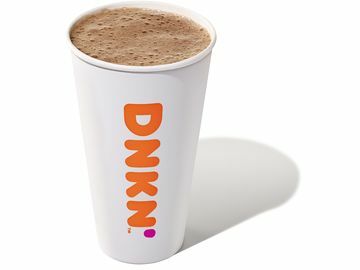 You can pick-up this gift for Dad at participating U.S. Dunkin’ Donuts restaurants. 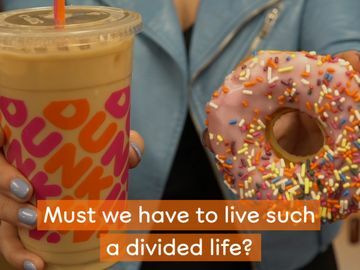 If you’re hosting a get-together at your house this Father’s Day, we have a wonDDerful recipe from our own culinary expert Chef Heidi Curry using Dunkin’ Donuts freshly brewed Iced Tea. Fire up your grill and treat your Dad to a delicious meal with Sweet Tea Glazed Chicken and some of his favorite sides! 1.) In a small sauce pot, on medium low heat, lightly brown ginger and garlic. 2.) Add spices and salt. Toast for a minute or two. 3.) Add brown sugar and Dunkin’ Donuts freshly brewed Iced Tea. Heat until dissolved. 4.) Remove from heat, allow to cool before using. 5.) Place chicken into an airtight container or sealable storage bag. 6.) Pour the Iced Tea brine over chicken and allow to sit in brine for a minimum of 8 hours (preferably overnight) in the refrigerator. 1.) In a small pot, heat the Dunkin’ Donuts Iced Tea, peach juice and brown sugar together on medium low, allowing the liquid to reduce almost in half. 2.) Once the liquid has reduced, add salt and vinegar to taste. 3.) The glaze is now ready to use and then divide the glaze in half. Half will be for glazing the chicken during cooking and the other half is for glazing just before serving. 1.) When ready to cook, heat grill and remove chicken from the refrigerator. 2.) Take chicken out of brine, pat dry with a paper towel. 3.) When grill is ready, place chicken on grill (skin side down) and allow to cook for 8-10 minutes on the first side. 4.) 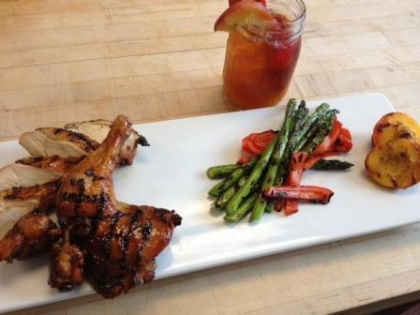 Flip the chicken, cook for another 10 minutes, at which time, you can now glaze the chicken sections with the Sweet Tea Glaze. 5.) Cook chicken until juices run clear and thermometer reads a minimum of 165°F. 6.) Remove from grill, allow to sit for 2-3 minutes before serving. 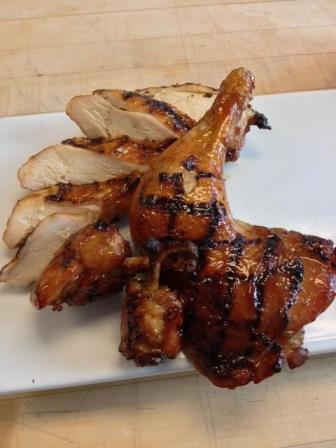 Serve Sweet Tea Glazed Chicken with your Dad’s favorite sides! 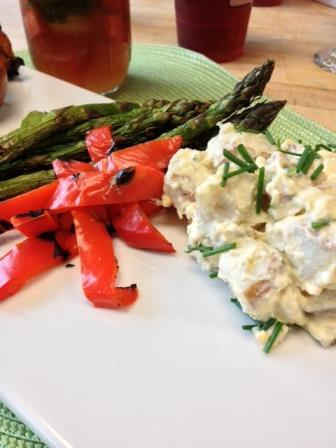 We made potato salad and grilled vegetables including red peppers and asparagus. • The recipes for the Dunkin’ Donuts Iced Tea Brine and the Sweet Tea Glaze are also great to use with pork chops and pork roasts. • The Sweet Tea Glaze also pairs nicely with grilled fruit! We used halved peaches and lightly glazed them with the Sweet Tea Glaze and then grilled them. • A refreshing Iced Tea creation is a fun pairing with this meal. Check out our at home mixology with Dunkin’ Donuts freshly brewed Iced Tea here for a step-by-step guide to creating an Iced Tea bar and tips on flavor combinations. Tell us how you’re celebrating Father’s Day this year on Facebook and Twitter! 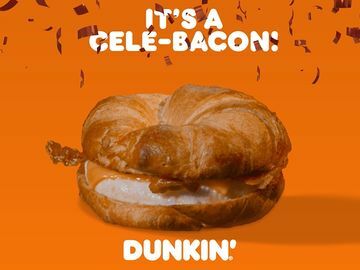 For more ideas and tips on cooking with Dunkin’ products, check out our recipes here.